This spread is full of fresh herb flavor with a bit of spice and some sweet cranberries. 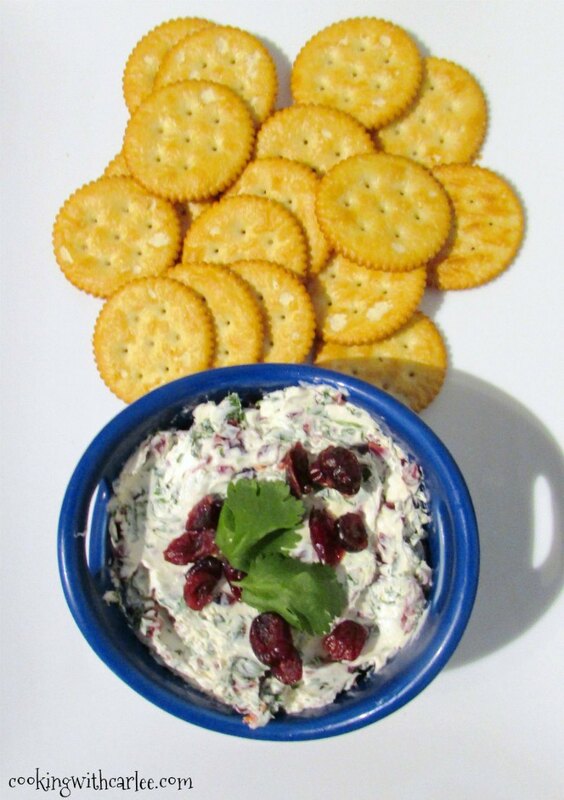 The balance is delicious and it is the perfect spread for crackers. It's holiday party season! And do you know what that means? Snacks! Whether it is a starter while the turkey is roasting on Thanksgiving or something to nosh on during the Christmas parties ahead, this cranberry spread will be a nice change to the standard fare. It has a really fresh flavor from the herbs and lime juice and just enough spice from the jalapeno to make it interesting. I don't think it would be too hot to upset anyone's pallet. I put this out when Chloe and MiMi came to help set up for Kristie's shower and Chloe LOVED it. When Matt and Jax came home, I got some out for them to snack on while I made a pizza for dinner. We had the whole thing eaten between us by the end of the night! We all thought it was pretty darn tasty and a bit different than anything we had ever tried. What do you guys have planned for Thanksgiving? We are going to my grandma's house for the famous spread. You should see the amount of food. I teased everyone with the description last year, but it was our year to do Thanksgiving with Matt's family so I wasn't able to get any pictures to corroborate my story. Maybe this year! Usually we have two or three different kinds of dressing, a couple of different sweet potato preparations, at least two turkeys, plenty of gravy, two pans of green bean casserole, of course there are cranberries, rolls and usually brussel sprouts. Then there are the mashed potatoes! There is always a debate on how much to make and we usually decide somewhere between 15 and 20 pounds should be enough. Of course there has to be dessert too. At Thanksgiving 2 years ago there were no fewer than 7 pies, a cake and a tray of my cinnamon brown sugar cookies. Of course our family is larger than most. My dad is one of six kids and so am I. But, not everyone is able to come at once so we normally have somewhere in the 25-30 people range. We eat our fill, then wait a bit and fill again on dessert. The next day my littlest brother and I always scheme and invite ourselves over for leftovers and games. So we generally don't leave grandma and grandpa with too awfully many leftovers by the time it is all said and done. 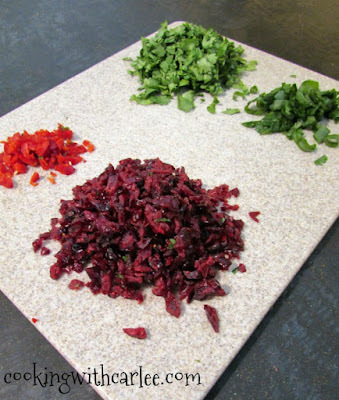 Roughly chop the cranberries, cilantro and green onions. You can serve immediately, but it is good to cover it and refrigerate it for at least an hour to let all of the flavors come together. Serve with crackers or toasted bagel chips or baguette slices. Sweet heat, sweet spread, sweet Carlee, the amazing chef!!! I am always looking for new apps and this one is perfect!! Happy Thanksgiving to you and your amazing Family!! I love sweet and heat and this is one pretty appetizer that sounds delicious! Love the sweet heat combination! 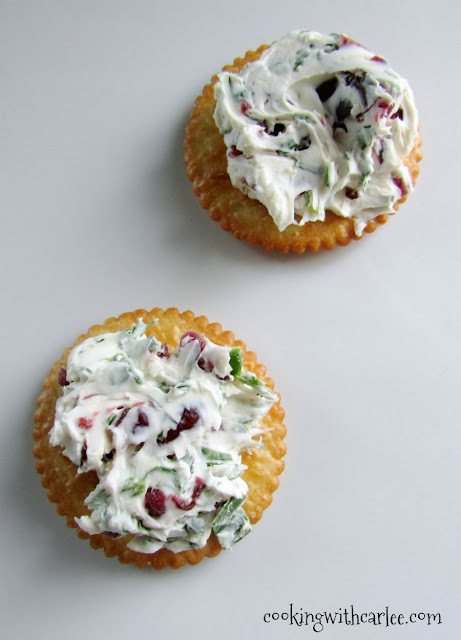 What a great holiday appetizer - love that I can make it before guests arrive. Look forward to trying it! Thank you! The more you can make ahead, the better! This looks SO good!! I'm a sucker for a spread or dip. And the addition of cranberries makes this amazing. Carlee, your Thanksgiving sounds amazing! I always wanted to be a part of a larger family! All that food, wow! This spread sounds great, too. Hey, you had me at jalapeno! This would be dangerous around me! Thanks! I thought about keeping it for myself too! This is a dip that I would love! Yum! 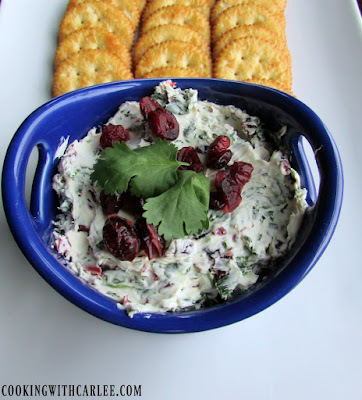 Love the addition of cilantro and jalapeño to this dip! Can't wait to try it...YUM! Thank you! It really made for a yummy treat. I hope you love it! That looks delicious! Thanks for sharing it on Funtastic Friday Blog Hop! Thank you, it was definitely a hit! I think this dip/spread sounds absolutely incredible. I wish I thought of it! Thank you! It was definitely a fun one! Dip might as well be a food group for me, I eat it that much 😂 I also love sweet and spicy combinations so I can't wait to try this one! I don't make dip too often, because once I get started it is hard to stop! But I do love a good dip and I love how simple they usually are to make. I have a feeling I'll be making a few more batches of this one this holiday season! This sounds and looks great! Can't wait to give a try this season. Thank you for sharing at Merry Monday!